John M. Daniel was born in Minnesota, raised in Texas, and educated in Massachusetts and California. He was a Wallace Stegner Fellow in Creative Writing at Stanford University and a Writer in Residence at Wilbur Hot Springs. 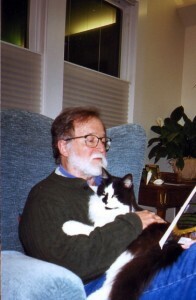 He has taught fiction writing at UCLA Extension and Santa Barbara Adult Education and was on the faculty of the Santa Barbara Writers Conference for nearly twenty years. He now teaches creative writing for Humboldt State University Extended Education. John’s stories have appeared in dozens of literary magazines. His thirteen published books include four mysteries: Play Melancholy Baby, The Poet’s Funeral, Vanity Fire, and Behind the Redwood Door, recently published by Oak Tree Press. John has worked as a bookseller, a free-lance writer, an editor, an entertainer, a model, an innkeeper, and a teacher. He and his wife, Susan, live in Humboldt County, California, where they are small-press book publishers. Susan enjoys gardening, John enjoys writing, and they both enjoy living with their wondercat, Warren. 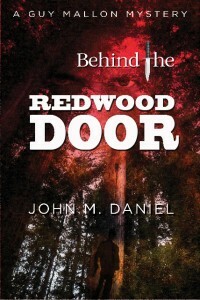 Behind the Redwood Door is sold by Amazon and Barnes & Noble. It can be ordered by your local independent bookseller, or bought directly from the publisher at http://www.oaktreebooks.com/. For an autographed copy, call John at 1-800-662-8351.
we writers must do, because it sorts our universe and gives wings to our souls. Once I got over the foolish notion that I wasn’t a good writer, things got easier. What did it matter if I was “good,” so long as I was having fun? Besides I was getting published, so there. I was mainly a short story writer back then, and stories are relatively easy to keep track of, even if they’re not always easy to write. fifteen different points of view, male and female, young and old, and it braided a dozen plot lines that kept intersecting and intertwining. I’m still proud of my first draft, but the first draft is as far as I got with the novel. The problem was the dates. I read and reread that draft and discovered to my chagrin that events that were the consequence of certain changes and choices actually occurred before the changes and choices happened; and some of the characters were born too long ago in back story to still be the ages they were in the front story; and characters kept getting surprised by things they already knew. Sometimes months had two or more full moons. And so on. Fix it? Oh sure, just fix it. I never did revise that novel. I tried a couple of times to untie the Gordian Knot, and was left with shreds that I converted into a few short stories. A couple of them got published in tiny magazines. But I learned a lesson: Whether you like to outline or like to wing it, it’s important to keep good notes and to make yourself a timeline. In chronological order, list birth dates of characters, dates of weddings and murders, dates of important full moons, and any other timely facts that might get you in trouble if you slip up. Believe me, this timeline devise paid off when it came to writing my newest, Behind the Redwood Door. It was especially important to keep track of such details, because my novel is about a feud that was built in the past. So the novel slips back into history three times: long interludes that take place in the late nineteenth century and in the early 1980s. I think the historical segments are the most entertaining parts of the book, perhaps because I let my writing get playful and took chances with plot that paid off. But without the timelines, those historical segments might have been hysterical instead. stabbed in the throat on Friday the Thirteenth behind the Redwood Door saloon. These are mysteries buried in the past, waiting for you to unearth them. You’ll find they’re all properly dated. I learned that one too, with my first big book, John. Fortunately, I learned it first but it still took me a long time to write the book. Thanks for reminding us that your timeline can be crucial. Beth, who also reminds you to leave a comment so we can all draw names when this tour is over and maybe you’ll win one of 60 or so books! Great post John who has many photos with his adorable cat, Warren. Keeping good notes and timelines is essential. For the last book I had to go look in my first book because I couldn’t remember which floor Mitch lived on. Small things but they make a big difference. Thanks for the reminder! Thanks so much, Wendy. Warren thanks you too! Always good to keep reminding us. And by the way, that was the huge thing that bothered me about the Da Vinci Code–no way could all that have happened in the time that it did. I listened to it and that drove me crazy. I kept talking back to the reader. Even though we write fiction, we want it to be accurate. I created an outline, “Characters and Chronology,” when I was in the early stages of writing my first novel. It made subsequent drafts of that novel and writing the sequel so much easier. An excellent post, John. I wing it and sometimes write myself into a corner. With my last novel I had to back up some 20,000 words and write in a new direction. Notes are invaluable, especially when writing a series or spooning in backstory. Thank you, Marilyn, Patricia, and Jean. It’s interesting that time sequence has been an issue for each of us, and we’ve all found ways to keep our ducks in a row. I write with two documents open: the manuscript in progress, and a NOTES.doc, where I keep track of things not to forget, including sequence. And they love to tell us, Stephen. So far I’ve escaped that, but I’ve seen other authors called out on the strangest details, but details that bothered the heck out of somebody. My first really big book was Second Generation, the one that won tons of awards and five star reviews. That one spanned over fifty years and you think that wasn’t fun to keep track of! I had one of those big drawing pads with timelines for everyone in the book, quite an undertaking. I haven’t tried that gig since. 😉 John, great blog subject, one rarely addressed but I’m glad you did. Yes indeed, Stephen and Beth. Readers love to tell us, or at least talk behind our backs, when we make mistakes in continuity. I find that continuity is a big issue whenever I take on a fiction editing job. I once had to remind a writer that the moon isn’t full every time lovers go for a walk at night. Especially twice in the same week. Oh, my, I can SO relate, John! Fix it. Right. Great post. Yes! Yes! Winging it most of the time, but every feather I complete has to go in the timeline. PS Great seeing Warren again. Thanks for the good & needed advice!!! A pat on the head to Warren if he allows that from online strangers. Loved the picture too. Hi John (and Warren!) Although I’m a pantser, I tend to stop at the 3/4 point of the first draft to create an Excel spreadsheet of each scene, when it takes place, as well as descriptions of all of the characters. I throw in everything about each person, and then go back to check and double check that I have it right. It’s not a flawless method, but it helps. John, I enjoyed this post so much. You spoke from your writer’s heart and in doing so, touched mine. And I thank you. Again, many thanks to one and all. I love this gang. And we love you, and we’re very happy to have got to know you a little more each day, John. And Anne, I never would have thought to make an Excel spreadsheet three fourths of the way through the novel, but it does make an awful lot of sense. Thanks for sharing that!